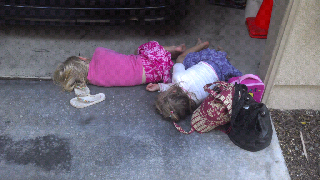 Both girls were asleep when we got home. I prodded a sleepy Val out of her car seat. I walked around the car, unbuckled Elaine and lifted her out. When I turned back around I saw Val had determined standing up to be too much work. Elaine took two steps, saw the sleeping Val, decided that looked like a splendid idea and joined her.